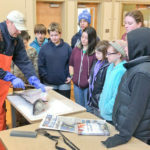 Thus I found myself waving a dead fish at a bunch of 6th graders at the Mahoney Middle School in South Portland last week. And they loved it — in the way you might love watching a horror movie, half wanting to shut your eyes (and nose), half wanting to get closer. So why did I bring a fragrant, dead sea bass caught in R.I. to a class in Maine? We were talking about invasive species, non-native animals, plants, fungus, pathogens, etc. that wander into local habitats and tip ecosystems out of balance. We discussed how ever warming waters in the Gulf of Maine have created an inviting environment for species that are native to the mid-Atlantic states and elsewhere. We also weaved terms like “habitat”, “predator/prey relationships”, “carrying capacity”, and “ecosystem balance” into the conversation. Unfortunately, there is no real, established commercial market for European green crabs. 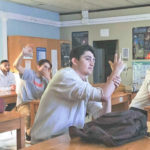 Students learned how most marine invasive species arrive via ships from distant waters, either on the hull, gear or in the ballast, as did the green crabs some time in the mid-1800s. We discussed how green crabs’ preference for warmer water has guided them north along the coasts as temperatures have increased. 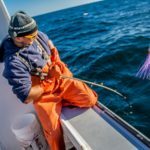 In the past couple of decades, their numbers in northern New England have skyrocketed, to the point where coastal researchers in Maine view them as “naturalized,” meaning they are comfortable living here. Though cold water may keep the crabs somewhat in check for a few months, they come back in numbers during the summer. Students learned green crabs can rock entire ecosystems because they eat larval mussels, clams and oysters and wreak havoc on critical eel grass beds, which are nurseries for said shellfish and many other baby species. They also learned green crabs have no significant natural predators and no commercial market value because they require too much work for too small amount of meat. As such, scientists, fishermen and fisheries managers are scrambling to come up with a viable means of reining in the crabs before they severely damage valuable shellfish markets. I finished each class with a ray of hope, born of the landmark climate change pact signed in Paris on Dec. 11. Nearly 200 countries, representing almost all nations on the planet, signed a document agreeing that climate change was real, that anthropogenic causes are fueling it and that each country needs to devise a plan to limit carbon emissions and demonstrate progress. 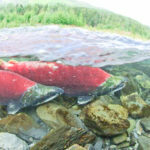 Students learned that agreement could be the turning point where collectively, countries around the world took the first step to slow the process by which warming waters are encouraging invasive species to become “naturalized” where they don’t belong.